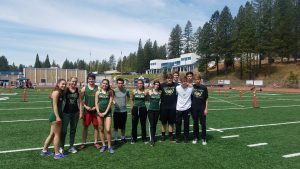 Final invitational before regionals took place at Nevada Union high in Grass Valley, California. Highlanders traveled with 12 athletes nestled in the foothills of the Sierra’s. Incline’s freshman Millie Jenkins took 1st in the last contested event of the day in high jump. She passed teammate Samantha Ginagreco’s school record to set a new height of 5’2″. Jenkins “I stayed in my arch more and took a faster approach.” Giangreco would finish in 8th place at 5’0″ and set a season record in the 100-meter of 13.76 and another 8th place in discus of 89′. Jenkins started the day in the 100-meter high hurdles finishing in 5th place at 17.30. The freshman boys would set personal best times. Dylan Cleary run the open 400 meter in 54.27, Niklas Pietzke would set his best in 4:56 for 1600-meters and 10:53.55 in the 3200-meter. Brad Rye ran a personal time of 56.29 in the 400-meter and set a new height of 10’00” in pole vault. Junior Dillon Jenkins set a personal time of 56.53 in the 400-meter. Jenkins was part of the distance group before moving to the middle distance where his endurance and power will set up Relay teams for Regional tournament in Yerington next week. The seniors of the team Belle Johnson cleared 7’00” in pole vault, 13’07” long jump. Hailey Carlson cleared 4-08″ in high jump and 13-02″ personal best in long jump. The boys Noah Cleary ran 25.71 200-meter in-between clearing 8-00″ in pole vault. Esten Flores shot was 38′-10″ and discus 105′-05″ for his personal best. Incline will compete in the Northern 2A Regional tournament beginning Friday at Yerington High School. The top four competitors in each event will move on to the NIAA State Tournament in Carson City May 18-19th.